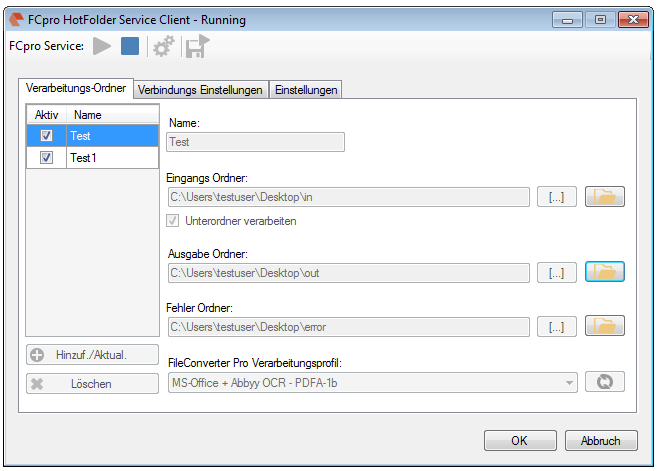 The background-processing was reimplemented and is now instead of as Windows service implemented as startable Icon Tray application. The jobs currently opened in the queue of the background-processing can be displayed. The updating of this queue is done automatically. 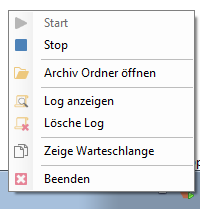 Via the context-menu of the background-processing – the processing can be stopped, started, the archive folder can be opened, the log can be displayed and deleted as well as the queue can be displayed. 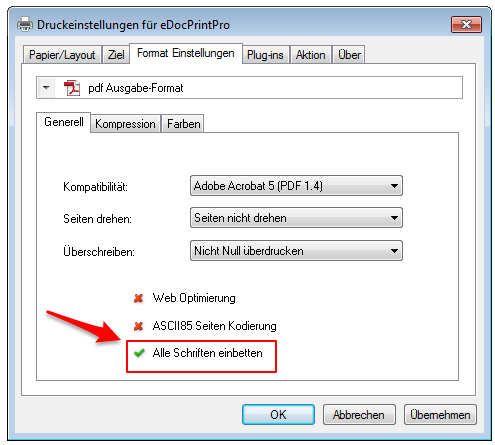 The eDocPrintPro SDK makes it possible to request and set all settings and configuration-options of the PDF printer-driver from an own application. Beside the plugin-interface, the functions of the driver can also be extended via “Add-On” modules. 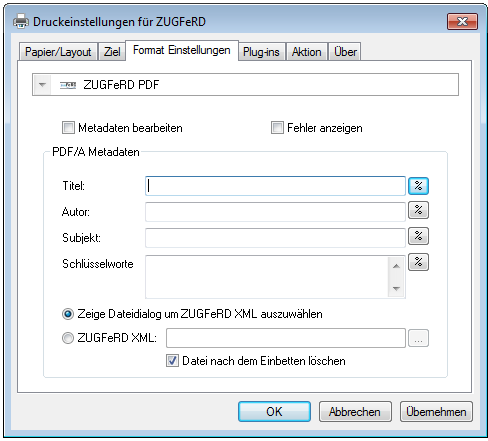 The PDF/A as well as the ZUGFeRD format was implemented as such Add-Ons’s. Each Add-On has a range of properties which also can be requested and set. Which properties are available for an Add-On can be seen in the SDK-documentation. 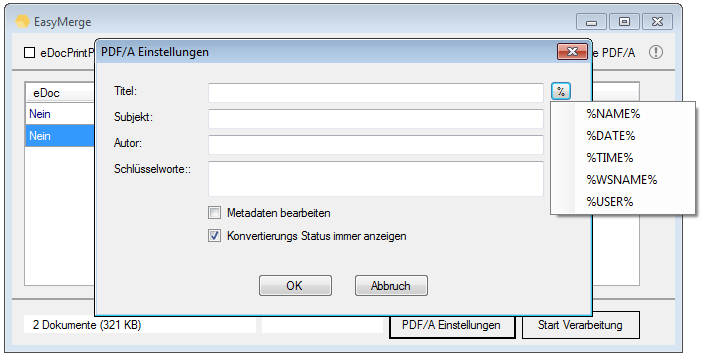 With the current version of the eDocPrintPro SDK it’s now also possible to read and set the properties for the PDF/A and the ZUGFeRD Add-On. Also a sample was added which shows how especially the ZUGFeRD parameters can be read and set. 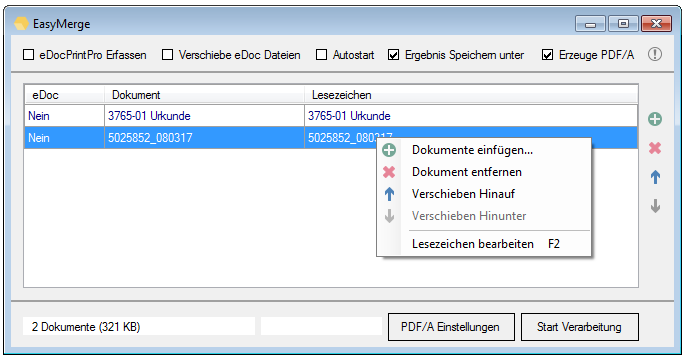 With this the ZUGFeRD version of our PDF printer-driver is adjusted to the current eDocPrintPro version 3.21.2. 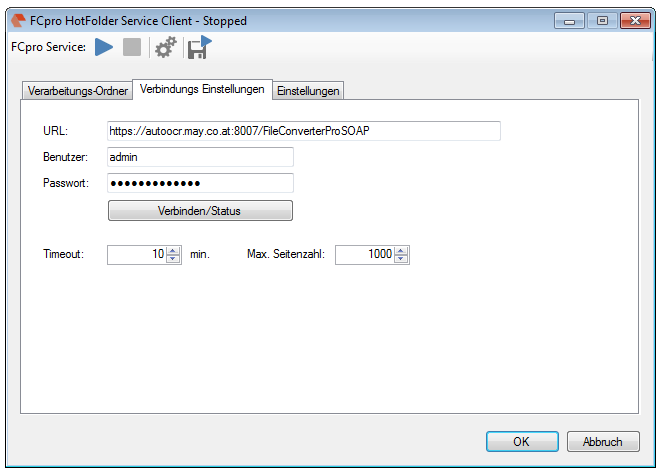 Therefor also the function to save all settings as profile (XML file with the extension *.esf) were extended to also make it possible to save and load the ZUGFeRD configuration-settings. By default out setup’s are delivered as EXE. But sometimes for automated installations or software-distribution a MSI is needed. This can be extracted from the EXE directly. 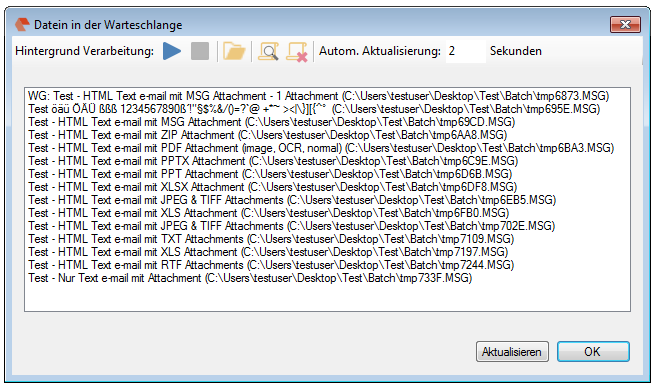 /extract <path> – extracts the MSI, included in the EXE, into the specified folder path. If the path contains spaces it has to be wrapped in quotation marks. MSI Commandline parmeters: For the installation with the MSI there are 2 more parameters then. With it 2 options which are offered in the setup can be set via the command line. 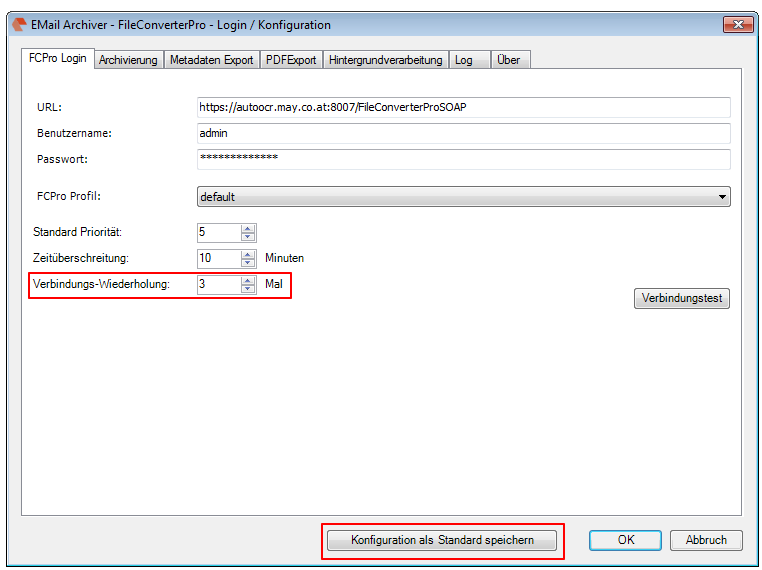 Read only of the configuration settings: To prevent configuration-settings to be changed in the configSettings.XML file there is an entry ReadOnlyConfig. If this is set to YES the configuration can’t be changed from the user interface anymore. We got requests from users for having an option to completely embed all fonts which are used in the PDF. This is especially required if the PDF files are passed to a printing company or printing service provider for outputting, because some of them explicitly request that. With the version 3.21.2 there comes an new PDF option – “embed all fonts” – if this option is active, all fonts get completely embedded in the PDF. Therefor not only a “subset” of the font – so, not only the used characters – but always all characters of the used fonts get embedded, even if only one character of it is used. This also applies for the 14 PDF standard fonts: Normally certain defined 14 PDF standard fonts are not embedded in a PDF because it was determinated, that these standard fonts – Courir (bold, italic, bold-italic), Helvetica (standard, bold, italic, bold-italic), Symbol, Times New Roman (standard, bold, italic, bold-italic), Zapf Dingbats – have to be available in a PDF-viewer application. 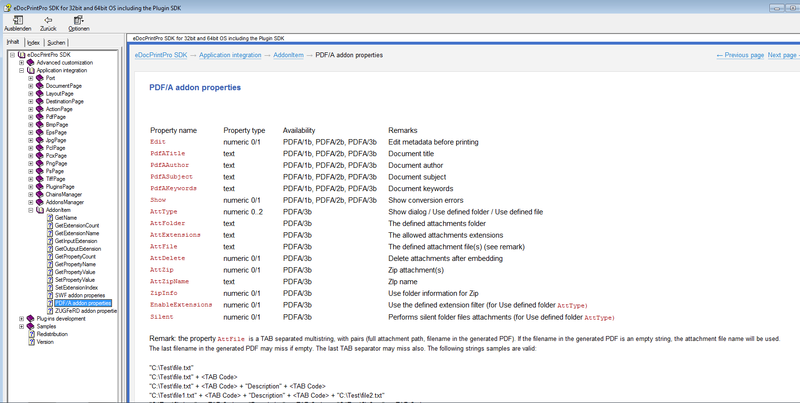 If this option isn’t active (standard), the 14 PDF-base-fonts don’t get embedded and of other fonts only the used parts. With that the PDF documents stay compact and small.